PORTERVILLE—A collection of legislators are taking another shot at getting state money to repair the canal carrying water to thousands of farms and several cities along the Valley’s eastside. Earlier this month, Senator Melissa Hurtado (D-Sanger), representing the 14th Senate District encompassing part of Tulare County, along with principal co-authors Senator Andreas Borgeas (R-Fresno), Assemblymember Devon Mathis (R-Visalia), Assemblymember Dr. Joaquin Arambula (D-Fresno), and Assemblymember Rudy Salas (D-Bakersfield), gathered along the Friant-Kern Canal in Terra Bella to announce the introduction of Senate Bill 559. The bipartisan supported legislation will secure California’s water supply by investing $400 million in general funds to repair subsidence in the canal caused during the historic drought. “From 2012 to 2016, California experienced one of the most severe drought conditions. As a result, many of our farmers, families and entire communities within the Central Valley continue to experience limited access to one of their most fundamental rights—clean water,” stated Senator Hurtado. Currently, the Friant-Kern Canal’s conveyance capacity has degraded due to several factors, including severe land subsidence caused by regional groundwater overdraft. A portion of the canal, roughly 20 miles long, has subsided twelve feet below its original design elevation, including three feet of subsidence from 2014 to 2017. As a result, the canal has suffered the loss of 60 percent of its carrying capacity—constricting the delivery of water to some of California’s most vulnerable communities. Jason Phillips, CEO of Friant Water Authority, which oversees the operation of the federally owned canal, said the limited capacity threatens 350,000 acres of highly productive farmland below the damaged portion of the canal, and also limit opportunities to maximize groundwater recharge projects that will be very important to helping the Valley comply with the Sustainable Groundwater Management Act. “On behalf of the farmers, businesses and communities who rely on the Friant-Kern Canal, we very much appreciate Senator Hurtado’s leadership on this legislation,” Phillips said. The 152 mile canal, which runs from Friant Dam in Fresno to the Kern River in Bakersfield, conveys water for groundwater storage and clean drinking water for some of the state’s most vulnerable communities. Moreover, the canal provides irrigation for more than 18,000 individual family farms­—almost a quarter of the Valley’s agriculture land and 22 percent of all farms in California. “SB 559 is crucial to keep the Friant-Kern Canal, the largest artery for water on the eastside of the Valley, afloat. This measure is extremely important to keeping this economic engine which powers our economy and provides tremendous benefit locally, statewide and even nationally. Failing to fix the Friant-Kern Canal is not an option, simply because not having water is never an option. I am proud to coauthor this measure with Senator Hurtado and look forward to bringing this funding to the Valley,” said Assemblymember Mathis. The canal also provides water to cities such as Fresno, Lindsay, Orange Cove, and Strathmore which do not have access to enough groundwater to supply its residents and businesses with water. Other cities may have to begin importing surface water to comply with the Sustainable Groundwater Management Act. Known as “sigma”, the 2014 law requires that every groundwater basin be water neutral in the next 20 years. Porterville Mayor Martha Flores said a fully efficient Friant-Kern Canal is vital to supply agriculture with enough water to avoid groundwater pumping, which is currently her city’s only source of water. 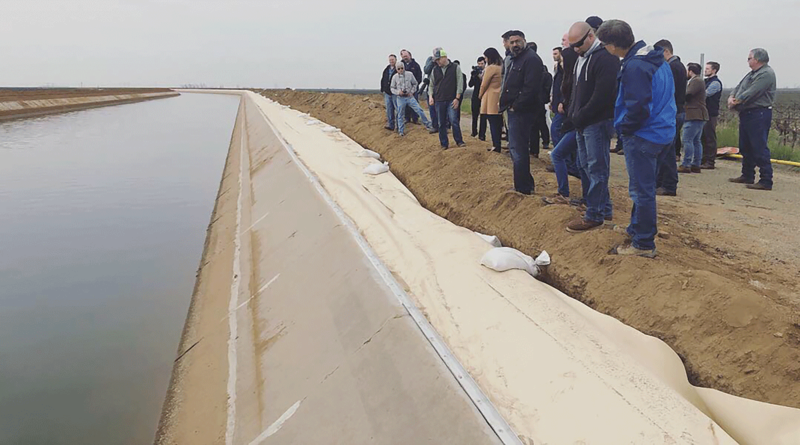 “The Friant-Kern Canal plays a valuable strategic role in the sustainability of Porterville as the city seeks to enhance its surface water recharge program and reduce its groundwater footprint,” Flores said. Titled 559 after the Valley’s area code, the bill also raises awareness about the rural communities struggling with water quality issues at a much higher rate than the rest of the state. Of the 2800 violations of drinking water standards across the state in 2017, most occurred in the Central Valley and the Central Coast. There were more than 815 violations in Kern County, 413 in Tulare, 328 in Fresno and 282 in Monterey. Tulare County had 124 violations for nitrates alone, more than double the nearest county, Kern County, with 59 violations. These included small water companies in every corner of the county including the Soults Mutual Water Company outside of Tulare, Lemon Cove Water Company, East Orosi Community Service District, and Teapot Dome Water Company near Porterville. Money to fix all of these problems was built into Proposition 3. The $8.9 billion water bond would have provided $750 million to repair or improve water conveyance infrastructure in the valley, $640 million for projects to implement California’s groundwater regulation, and $750 million for water and wastewater treatment for lower income communities. The statewide bond was defeated with more than half of the state voting against it last November.